Happy Bloggers Challenge Friday, I hope you've been having a great week! I've been enjoying this bit of cooler weather we've been having, and it's perfect for this weeks BC Challenge Theme; to create something Fall related. 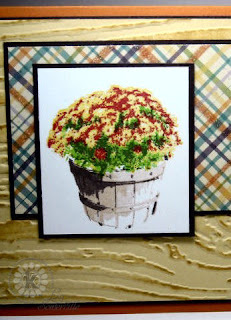 I could have went in a lot of different directions with the Fall Theme: Apples, Pumpkins, Sunflowers, but decided to use the beautiful Mums from Kitchen Sink Stamps Multi Step Harvest Set, aren't they pretty! Pulling colors from the Cloud 9 Papers, I stamped the Bushel Basket and Mums on White card stock. For the background panel, I stamped the sentiment in Chocolate on Saffron card stock, then embossed using the Woodgrain Texture Fades Folder. Color was added using the Cuttlebug Highlights Technique. Looking for more Fall related ideas, click on the Bloggers Challenge Logo on my sidebar to see what the other players created this week. What a beautiful use of color! luv that card! Looks just like a basket of mums you'd find at the garden center right now! Lovely! Love the texture behind the image too! Love the way you sponged the textured paper. Looks like real wood. Gorgeous card and the background fits the fall feel wonderfully! TFS! Beautiful basket of mums. Love the designer paper. The woodgrain background goes perfectly with the basket. Great fall card. Lovely mums! Now I really love how you used the woodgrain embossing background to go with the wooden basked of mums! The colors are stunning! Have a great cooler weekend! Gorgeous. Mums are the perfect Fall flower. Love the colors you used and that great embossing folder. Great textures. This is super fall like! Thought this might be your bloggers challange card when I commented on TJ and it is still a great card!!! What a beautiful card! I grew up in the Mum Capitol of the World, Bristol Connecticut. We had Mum's Parades and Festivals. This card is so pretty. I love the bg paper, and the image is so beautiful. So life like. Great card, I like the flowers and that paper. The background is perfect with this image. You've done one amazing job of stamping those mums! They look so lifelike!!! Great background you've created too. I LOVE this!! Those mums are perfect for a fall card! Just lovely! Love that Woodgrain Texture Fades Folder, what a great background it makes. Beautiful basket of mums...the perfect autumn flower! Oooooo, I like it, I like it!! what a pretty card....reminds me that I must get out some of my flower-soft and try something for the fall. Gorgeous mums! Love the cards. Wonderful fall cards. So pretty! Love the basket of flowers!!! Oh my word...that stamp is perfect fall and captures such a depth of color...great challenge Lisa thanks so much..
What a pretty image! I love that embossing folder too! Fabulous! That basket of mums is gorgeous with the colors you used...so lifelike! !